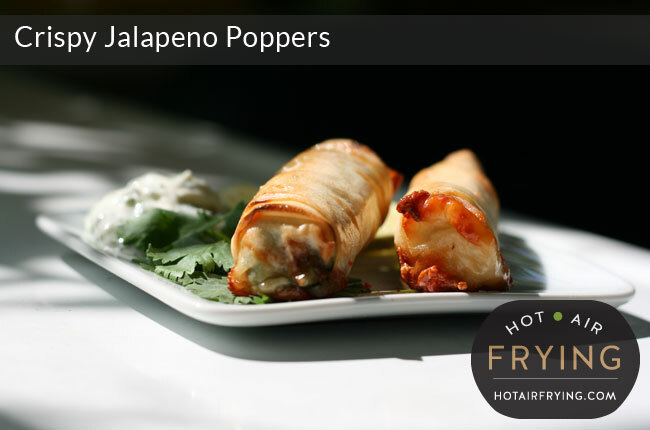 These Crispy Jalapeño Poppers are really dead easy to make, and even less work to cook. They are made in the top pan of a two-level Actifry™ (“Actifry 2 in 1™”) or in an air fryer such as a Philips Airfryer™. Serve piping hot with something like a marinara sauce or our Skinny White Dipping sauce. 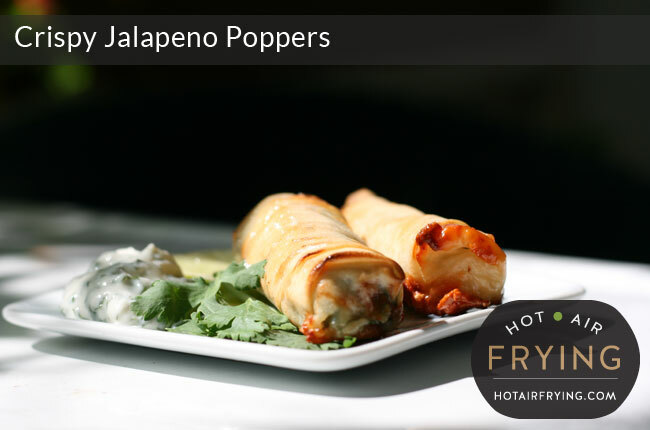 Below are the ingredients to make 1 serving of 2 poppers, for 1 person. Multiply as necessary for the number of people you are serving. Hot, cheesey, gooey, crunchy, cripsy pastry rolls -- people won't believe, or care, that they are so low cal! Prepare the peppers: chop stem end off, slice lengthwise, trim out inner white pith and all seeds - we used a serrated paring knife as shown in assembly photo. (Tip! feel free to rinse under water to wash stubborn seeds away.) Pat dry if needed; set aside, trying to keep matching halves together. Divide the cheese into 2 x 1/2 oz (15 g) strips. Peel off a sheet of spring roll wrapper, and cut in half. Brush each half with half a tablespoon of the liquid egg mixture (either Egg Creations or Egg Beaters), particularly the edges. Place a half of jalapeño in one corner of the spring roll wrapper half (egg-brushed side up) as shown, place a strip of cheese in the cavity, and top with the other half of that jalapeño pepper. Holding the two halves of the pepper together, roll the pepper up tightly in the springroll wrapper on the diagonal, folding the edges in. When done, do a quick visual check for any loose edges of wrapper -- glue any found down tightly with a quick brush of the egg. When all are assembled, give each popper a very light spray with cooking spray. Turn over, spray the other side lightly. Place in top tray of Actifry™ (no need to spray the top tray) or in the basket of a machine such as an Airfryer™. You can fit a max of about 8 at a time in. Turn Actifry / Airfryer on for 10 minutes, at which point they will be done. There's no need to turn them during cooking. You may wish to give them another minute or two to brown them further, depending on the phase of the moon and how well they browned. Serve piping hot with a marinara sauce or Skinny White Dipping Sauce. Start with pepper half-off corner of egg roll wrapper as shown at left, then roll up diagonally as shown at right. 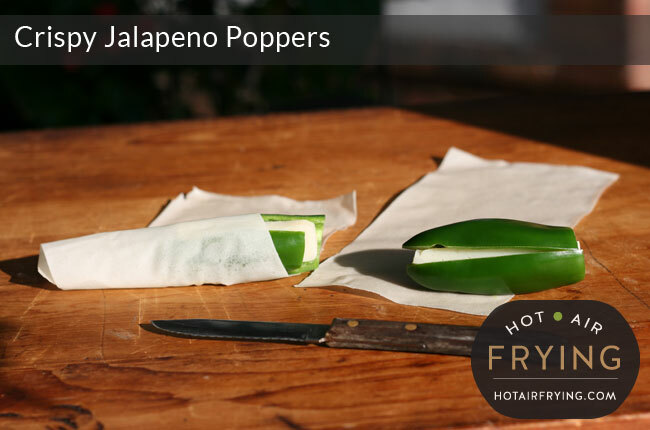 Jalapeños are extremely mild chiles as far as chiles go; even so, after you have finished, wash your hands thoroughly with soap and water and keep them away from your eyes, because even the mild heat in jalapeños is enough to make your eyes irritated and water. Without an air fryer of some sort, you can try baking these instead for 10 to 15 minutes. 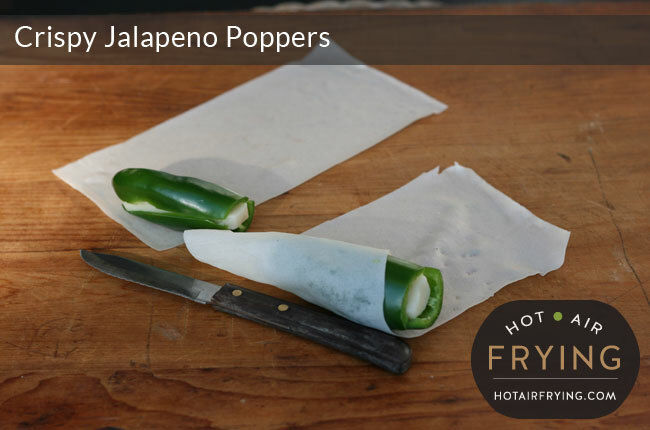 You may wish to try nuking the jalapeno peppers (after cleaning and before assembly) for a minute or two, though, as the peppers themselves may stay rawer than they would being blasted by the hot air in a hot air fryer. This additional step would really depend on your personal preferences. You can make a big batch of these ahead (store in fridge in sealed plastic container) and reheat them in an air fryer or toaster oven as needed. To reheat a lot at once in an Actifry, bring to room temperature, put in bottom bowl of Actifry with paddle in (sic), and give them about 4 minutes. 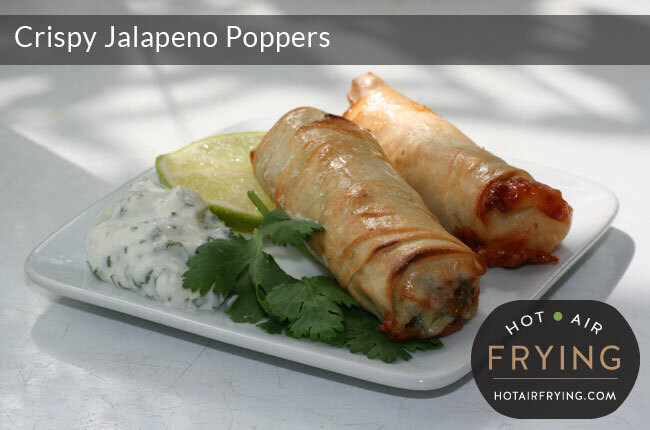 3 Weight Watchers PointsPlus® gets you 2 Crispy Jalapeno Poppers (plus a free bonus, if desired, of 1 1/2 tbsp of the Skinny White Dipping sauce shown in the recipe photo.) 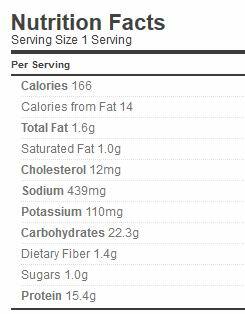 In calories, it’s 166 for the 2 poppers. We used a low-fat cheddar-type cheese (Allégro™ 4% White) which was 1 ww point (60 calories / 1 g of fat) per 30g / 1 oz. We used Spring Home™ spring roll wrappers, which are 20 x 20 cm (8 x 8 inches) in size and just 1 Weight Watcher point per sheet. * PointsPlus™ calculated by hotairfrying.com. Not endorsed by Weight Watchers® International, Inc, which is the owner of the PointsPlus® registered trademark. * Airfryer™ is a registered trademark of Koninklijke Philips N.V.